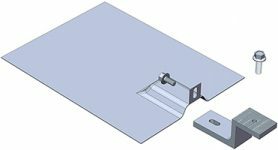 In addition to providing a complete line of solar mounting and roof attachment solutions for all types of sloped roofs, Magerack also provided various accessories to help solar contractors with solar installation, such as module-level accessory mounting bracket, conduit mount, etc. They are compatible with Magerack solar mounting solutions and also mounting system from other manufacturers. Magerack Comp Conduit Mount and Tile Conduit Mount provide mounting platforms for securing conduits on composition shingle and tile roofs. They use the same roof attachment and flashing techniques as L-foot with Flashing and Tile Hook with flashing that provide easy and effective solution for waterproofing roof penetrations on composition shingle and tile roofs.